Why would a book review bear a title that directly contradicts the book’s own title: You’ll Like It Here? Young Donald recognized this deceit because of the rough way he was treated, his desire to “puke”, and because this putative school had bars at the windows and padlocked doors. “School” was a misnomer for Belchertown. You’ll Like It Here. The Story of Donald Vitkus Belchertown Patient #3394 is Vitkus's biography, written by Ed Orzechowski, a writer and retired high school English teacher in Northampton, Massachusetts. The memoir exposes the painful irony of its title by telling the whole truth: a story of tragedy and triumph. The tragedy is that Belchertown existed for containment only—not care, not education. It stayed in business under state auspices for seventy years (1922-1992)—even after a 1973 Federal class action lawsuit against the institution’s leadership for cruelty and dehumanization. Children and adults, commonly diagnosed as “idiots”, “imbeciles” or “morons”, lived under inhumane, unstintingly cruel conditions. but not before some runaway attempts. One could call runaway behavior desperate, foolhardy or just plain natural chutzpah. Vitkus always was caught of course, yet he never gave up. Once a compassionate policeman took this child for ice cream before he returned him to Belchertown. One ice cream is heaven when you’re in hell. Life after Belchertown, though less breathtaking, had rough patches but just as many graces for Vitkus, not the least of which was his meeting Ed Orzechowski in 2005 at an event to publicize a book called Crimes Against Humanity and asking Orzechowski if he would be interested in writing his story. Orzechowski agreed to a conversation. That conversation would turn into eight years and some forty hours of taped interviews, not to mention patience, courage and yes, affection. The men collected official records and documents to prove their book was not a work of fiction. This book is uniquely the product of a relationship of trust between author and subject, a relationship that gives this book its integrity and intimate worth. Orzechowski listened very closely in order to write the story in Vitkus’s voice. At times he felt as if he were “channeling” Donald. The process wasn’t easy, Orzechowski told me when I contacted him. 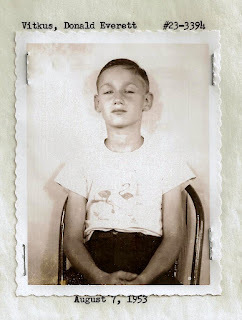 “I first had to learn to write a book,” he said. “But Donald pushed ahead, because he never wanted ‘to go back to those days.’” It’s not easy to write someone else’s memoir and make it vibrate with a voice not your own. 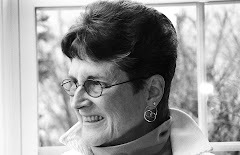 Orzechowski writes with exceptional craft, skill, and clear-heartedness. Sometimes a memoir helps a person, not to forget or resolve every painful memory, but to give a lived experience shape, form, and right words outside one’s own mind—contained, shelved and ready for others to read and find empathy and hope. A memoir can be a kind of miracle this way. Vitkus had first to entrust his whole story to a stranger. He wanted others not to feel alone in their truth, and most of all, he wanted to prove he was no moron. Donald Vitkus as an adult in his late sixties is pictured here. Vitkus lurched clumsily toward happiness as he grew in body, mind, and spirit in spite of having grown up deprived of affection, adequate health care, and most all of life’s most urgent basic lessons from table manners, to language, to pubescent impulses, to the meaning of love—save the inner longing that signals love’s absence. We are not left with the impression that Donald is free of all his scars. He still has a strong aversion to authority. In his efforts to manage life outside he flounders. And he still sleeps with the covers over his head. -a writer who never allowed his own emotions, which would have to have been painful, overwhelm the plot or the truth of his subject. 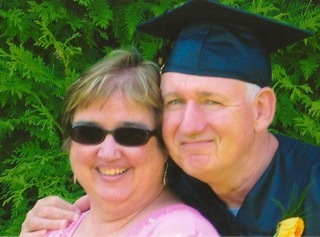 Here is Donald Vitkus with his present wife Pat at his graduation from Holyoke Community College in 2005. Readers of this book will find faith, hope, love, and grace. Darkness and light co-exist, neither overwhelming the other. You’ll Like It Here is ministry—restoring dignity to the innocent and exposing larger social justice issues with universal implications. Ed Orzechowski, by the way, has also proved he does know how to write a book. “Sincerely, the Sky” from Dear Sincerely by David Hernandez, © 2016. Aired by permission of University of Pittsburgh Press. Thanks so much for your wisdom and for being blue—or not. When I was a kid I thought the sea was blue like you, too. I know you’re just sun-mottled molecules, or my tendency to project all my dearest dreams onto every scape, but to me you’re the glory of God—divine true-blueness. I’m on an island now, surrounded by you and sea and sand. When I’m here I forget all about the many careful distinctions people attempt to draw between science and religion. They just don’t matter when you’re bright blue, the sea is deep blue-green, and the silky white sand sticks like glitter to my salted nakedness. I’m in one piece when I’m here. So is the cosmos. 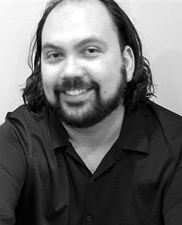 David Hernandez, born in Burbank California in 1971, is a prize-winning poet who teaches creative writing at California State University-Long Beach. David is a year younger than my youngest son, which makes me feel old, but not old-mother old. David is four years younger than my other son who aspires to be a poet himself—which he already is. I know because poetry is soul-deep and sky-high.